Steve Jobs thought someone might kidnap his daughter in order to blackmail him, according to a newly released Department of Defense document that was filled out in the 1980s when Jobs underwent a background check for a Top Secret security clearance. That revelation, along with some new details on Jobs' drug use and a previously unreported arrest as a minor, comes from a questionnaire that Jobs filled out for the clearance investigation, which was acquired by Wired through a Freedom of Information Act request. While being interviewed by investigators for the clearance in 1988, Jobs was asked in what ways he might be susceptible to blackmail. He replied that he had an illegitimate daughter and felt that "the type of blackmail or threat that could be made against me would be if someone kidnapped [her]." But he added that if he were blackmailed, it would "primarily be for the purpose of money, not because I may have access to classified Top Secret material or documents." "[I]f I do receive my clearance," he said, "there can be a possibility of blackmail and I do acknowledge this fact." An unidentified woman who was also interviewed by investigators to provide a character reference for Jobs, took a contrary view on the blackmail question. She indicated that because Jobs was a public person whose "dirty laundry" was already publicly aired, she thought he would not be susceptible to blackmail. The statements, along with notes made by the investigators who conducted the clearance probe, expand a bit on information that was already revealed in Jobs' FBI file, which the Bureau released last February in response to a FOIA request filed by Wired and other media outlets. Some of the information also appeared in writer Walter Isaacson's extensive biography of Jobs that was published shortly after his Oct. 5, 2011 death. The new DoD documents reveal that Jobs was arrested briefly in 1975 over a minor infraction, which has not been reported before. The topic came up after investigators learned that the tech titan had failed to disclose the incident in his security clearance questionnaire. When asked about it, Jobs wrote in a statement that he did not mention the arrest in the Personnel Security Questionnaire, or PSQ, because he didn't consider it an "actual arrest." The arrest was over failure to pay for a speeding ticket. Jobs said the arrest occurred in Eugene, Oregon, more than a decade earlier when he was being questioned by police for suspicion of possessing alcohol as a minor. The police discovered there was an outstanding arrest warrant for the unpaid ticket and apparently executed it on the spot. Jobs said he then paid the speeding fine, which was about $50, and that was the end of the matter. But he didn't consider it a real arrest that needed to be reported. "I had no intentions of falsifying my PSQ for not listing this incident and did not think of the above incident at the time of answering the PSQ," he wrote in a statement. In his statement to investigators, Jobs also talked freely about the illegal phone phreaking he did in his youth – using a Blue Box device to make long distance calls for free. "The challenge was not that I could make long distance phone calls for free, but to be able to put a device together that could accomplish that task," he said in his statement. "I did not make a profit from what I considered this to really be a ‘project.' At the age of approximately fourteen, it was a technical challenge, not a challenge to be able to break the law." There's a handwritten addition on the form that has Jobs' initials next to it, which reads "This was the reason I used LSD." He said that he had smoked marijuana with friends or eaten it cooked in brownies, but that the last time he had used the drug was in 1977. On a form asking him to describe his use of alcohol, Jobs, or one of the investigators, wrote "NA." Jobs' mercurial temperament has long been part of his lore, and he's never tried to deny that he has anger issues. But in the statements he gave the DoD in 1988, although he admitted that he had lost his temper in the past "when things are not going right," he said he had put this bad behavior behind him. He attributed his angry outbursts to perfectionism, and said he now had his emotions under control. Jobs told the investigators he considered himself an emotionally and mentally stable person, but admitted to previous bouts of depression. Though he had never received medical treatment or counseling for any mental disorder, he said he had once attended a two-month course at the Oregon Feeling Center. "This course primarily delt [sic] with getting in touch with your feelings and understanding your feelings," he said. A sentence in the written statement says the course was titled "Primal Scream," but this was later crossed out in the document. Jobs' initials appear next to the crossed-out text. According to one unidentified woman interviewed for the clearance, Jobs was inclined toward "spiritual sole-searching" [sic] through meditation that he did at home. The documents also detail Jobs' travel over the years, including a visit he made to the Soviet Union in the summer of 1985 in an effort to market Apple products there. The trip was facilitated by an international lawyer who was based in Paris and later met Jobs and one of his Apple colleagues in the Soviet Union. Jobs told investigators that he had a "feeling" the attorney who accompanied them "worked for the CIA or the KGB," though he offered no explanation for this. During the trip, which lasted two days, Jobs and his Apple colleague met with a professor from the Academy of Science, whose name is redacted in the document, "to discuss possible marketing of AC's product." The fact that Jobs had a Top Secret security clearance was mentioned briefly in the FBI file on Jobs that was released earlier this year. The FBI file primarily contained details from a different background check on Jobs that was done for his appointment in 1991 to the president's Export Council, under former President George H. W. Bush. But the file also noted that Jobs had held a Top Secret government security clearance while working at Pixar. The file didn't provide other details, however. The DoD documents released to Wired don't indicate why Jobs was being given a Top Secret security clearance, but according to Walter Isaacson's biography of Jobs, the Pixar clearance was required because of contracts Pixar signed with intelligence agencies to use its Pixar Image Computer for rendering information from reconnaissance flights and satellites. The security clearance was conducted in 1988 while Jobs was chairman of the board at NeXT, which he had founded in 1985 after parting ways with Apple, and while he was still owner of Pixar. Jobs had purchased Pixar, when it was known as Graphics Group, from LucasFilm in 1986. 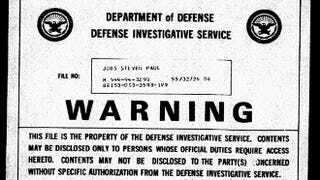 In the DoD documents, a note from investigators indicate that they tried to obtain Jobs' employment records from NeXT going back to September 1985, but the company's human resources manager told them that because Jobs was founder and chairman of the board of NeXT, "there are no records kept" on him. Investigators didn't fare much better at Apple. A note says all they got from Jobs' personnel file there was his name, address, date of birth and Social Security number.